The weather is getting cooler, which allows more stews on the menu. 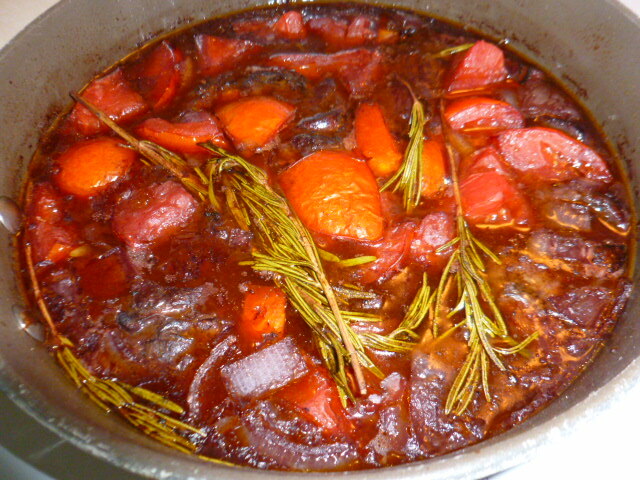 At the same time, fresh juicy tomatoes are still available, so before they disappear, I’ve decided to use them in this lamb stew. It was a good decision, as their acidity and slight sweetness balanced the fairly heavy lamb meat beautifully, along with the onion and red wine. Only few ingredients are needed to create this easy and tasty rustic stew, and the slow braising will extract wonderful flavor from them. I sliced the onions fairly thick, and didn’t sauté them first, as I wanted them to only soften while they absorb the red wine and juices. 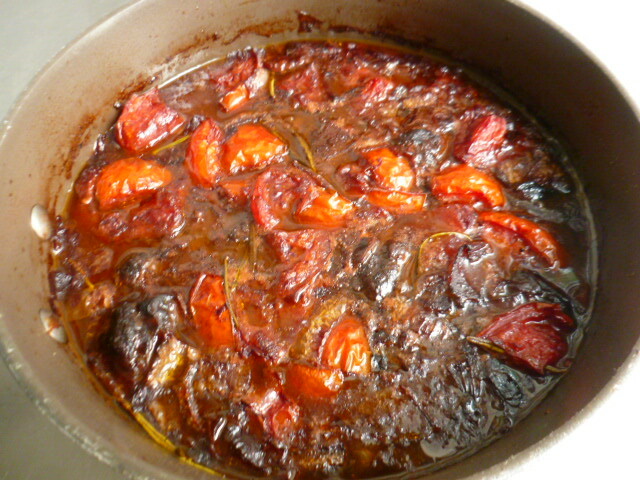 The tomatoes were also cut into large chunks, so they could keep their shape and not dissolve into a sauce. 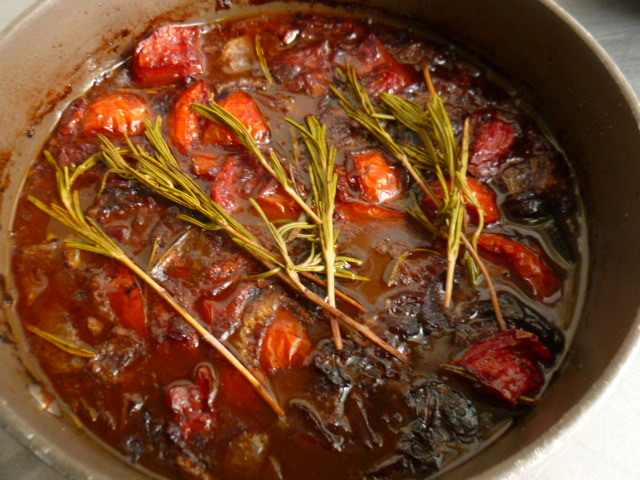 The rosemary added its’ wonderful aroma, that goes so well with red wine. 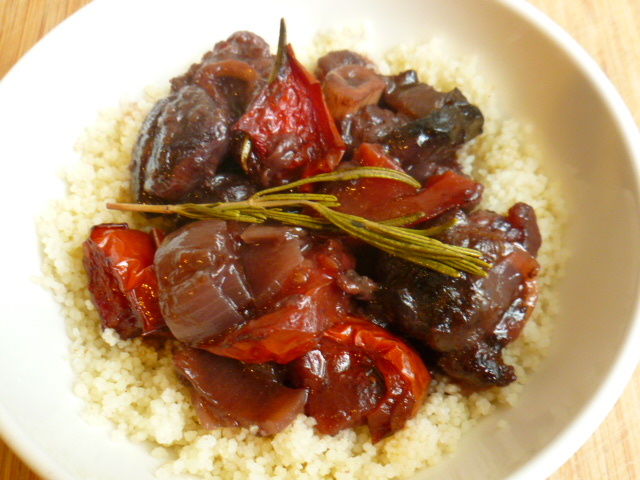 I served the stew over a bed of plain couscous, that was only seasoned with salt, as the stew is bold enough in flavors. Try it and enjoy. 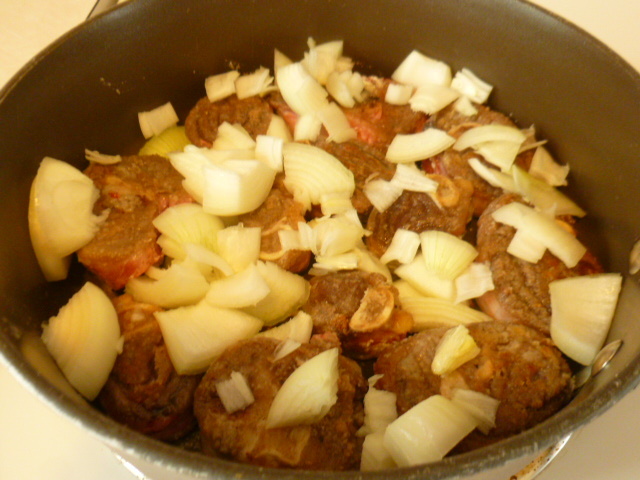 * Cuts that have more meat and less bones can be used instead of the shanks. * Beef can substitute the lamb. * The stew will taste even better if kept in the fridge overnight, so plan accordinly. 1. Heat the oil in a large wide pot, over medium-high heat. 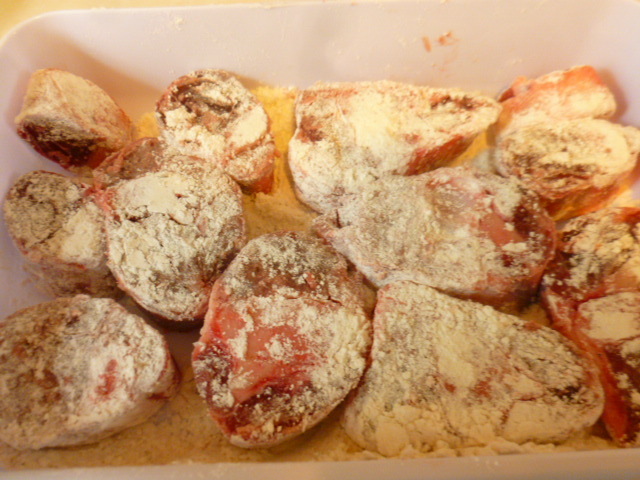 Mix the flour with some of the salt and pepper and dust the lamb shanks with it. Fry for 3-4 minutes, until nicely browned on both sides. 2. Add the onions and tomatoes on top, and season with the rest of salt and pepper. Add the wine and honey and mix gently. Place the rosemary on top. Cover the pot and bring to a boil. Reduce the heat to medium and cook for 20 minutes. 3. Preheat the oven to 200F (93C). Place the covered pot in the oven and braise for 1 hour. 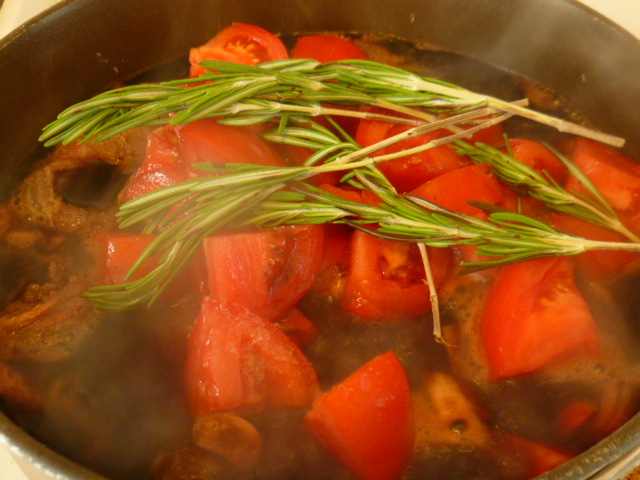 Uncover the pot and remove the rosemary sprigs, so it will not overpower the flavor (keep it for garnish). Place the pot back in the oven and braise for another hour, or until the meat almost falls off the bones. 4. The stew can be served at this point, but it will taste even better after a night in the fridge. In this case, bring the dish to room temp, cover and place in the fridge overnight. When ready to serve, reheat over medium-low heat. 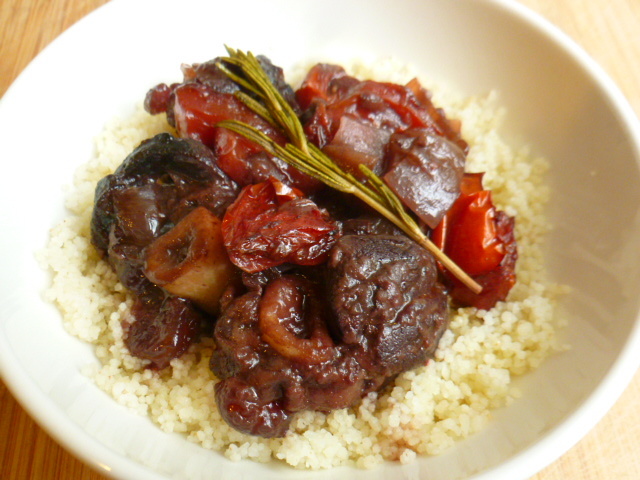 The stew is best served over plain couscous, Israeli couscous, or polenta. You’re so right! It’s a wonderful time of year from a culinary standpoint. I just made a ratatouille-type mixture with the most beautiful ripe tomatoes, and it was perfection! Lovely stew. It is a Catalon version called Samfaina. OMG so wonderful. On the blog soon…. Love lamb but I always seem to use chops, leg or rack and not the shanks. 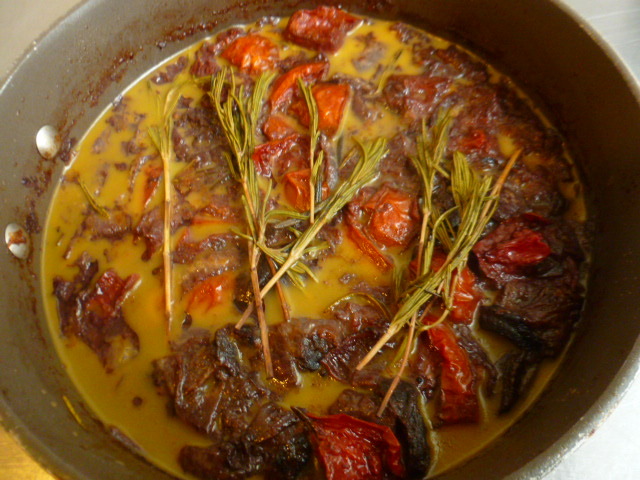 I am still getting good tomatoes too but not for long – lamb and rosemary are a good pair. Ooohhh! I’ve only made lamb once and have been looking for more flavors to pair it with, this is perfect!! What a great recipe, Ronit! I don’t believe I’ve ever had a lamb dish quite like this before. Sounds wonderful! Just look at those tomatoes! YUM!! Stew sounds delicious! It’s gone from summer to fall to wintered and back to fall today here in PA. A stew sounds perfect! Your lamb dish recipe is always tempting – like the one with fennel! Looking forward to the new ones! We love lamb shanks and yours look so good. 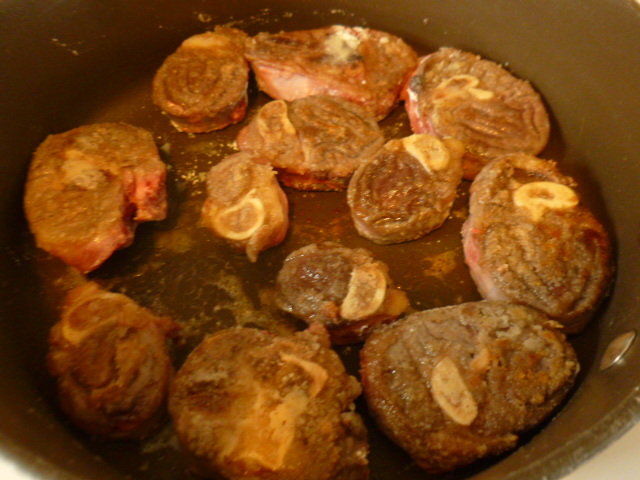 I’ve never seen the shanks cut into small pieces similar to veal for osso buco before. Must ask my butcher if he will cut them that way…thanks for the inspiration. Thank you Karen, I’m glad you liked the recipe. Lamb shanks cut this way are indeed not very common. I hope you’ll be able to get them. They produce a completely different flavor than the whole shank. I’m sure if I ask the butcher at our market that it shouldn’t be a problem. That is what I like about visiting your blog…I find lots of new ideas so thank you.